Scratch the skin of a saint, claimed George Orwell, and you are bound to find a sinner with an extensive resume. Such resumes are evaluated in these modern times by accolades, awards, and summits. The Noble Peace Prize tends to be crowning affirmation that somewhere along the line, you sufficiently fouled up to merit it. The calls, some even shrill, to have the Nobel Prize taken off Aung San Suu Kyi, are distressed lamentations of misplaced loyalties, even love. The de facto leader of Myanmar is showing what others have in the past: partiality, a harsh streak, and a cold blooded instinct. The saint, in other words, has been scratched, and the unquestioning followers are startled. When asked to respond to the arrival in Bangladesh of almost 150,000 stateless Muslim Rohingyas since August, the result of violence in Myanmar’s northern Rakhine state, the leader sternly rebuked suggestions that there was a problem. After all, the initial violence had been perpetrated by assaults on an army base and police posts by Rohingya insurgents since October. Faking the fleeing of tens of thousands of persecuted souls would surely be a challenge. The response from Suu Kyi is a salutary reminder that genocides, atrocities and historical cruelties can be often denied with untroubled ease. Her statement in response to the crisis was one of conscious omission: the Rohingyas barely warranted a mention, except as a security challenge. 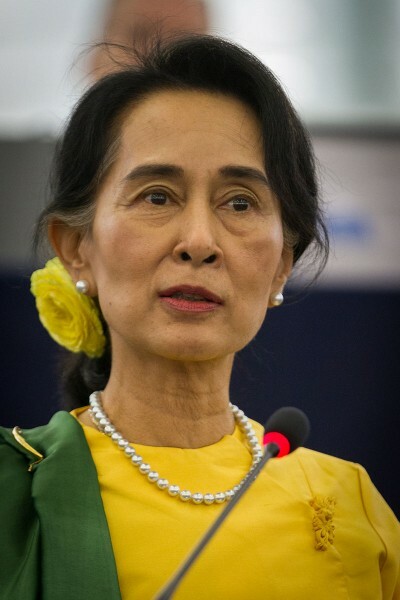 The statement issued from her office on Facebook claimed that the government had “already started defending all the people in Rakhine in the best way possible.” The misinformation campaign, she insisted, was coming from such individuals as the Turkish deputy prime minister, who deleted images of killings on Twitter after discovering they were not, in fact, from Myanmar. The approach to misinformation taken by the government has been one of silence and containment. National security advisor Thaung Tun has made it clear that China and Russia will be wooed in efforts to frustrate any resolution that might make its way to the UN Security Council. As for calls of terrorists sowing discord, Suu Kyi may well get her wish. Protests organised in Muslim regional powers are already pressing for the cutting of ties with Myanmar. Turkey is pressing for answers. The Islamist tide, should it duly affect the Rohingyas, will itself become a retaliatory reality. This sting of crisis and realpolitik was all too much for certain members of the Suu Kyi fan club. It certainly was for veteran Guardian columnist George Monbiot. He, along with others, had looked to her when jailed (house arrest or otherwise) as pristine, the model prisoner, the ideal pro-democracy figure. When held captive, the purity was unquestioned. Hopes were entrusted, and not counterfeit ones. Not so now. Crimes documented by the UN human rights report of February have been ignored. The deliberate destruction of crops, avoided. Humanitarian aid has been obstructed. The military, praised. When violence has been acknowledged, it has only been to blame insurgents who represent, in any case, an interloping people who are denied their ethnicity by the 1982 Citizenship Law. How often has history shown that the prison is merely the prelude to a recurring nastiness, political calculation, and revenge? Far from enlightening the mind and restoring faith, it destroys optimism and vests the inmate with those survival skills that, when resorted to, can result in carnage and misery. Suu Kyi, in other words, is behaving politically, fearing the loss of her position, aware that behind her is a military that needs to be kept, at least partly, in clover. Other Nobel Laureates have also added their voices to the roll call of concern, less of condemnation than encouragement. One is Professor Muhammed Yunus. Yunus, however, is more optimistic that the selfish, distancing leader will return to her peaceful credentials. From a dark sleep, she will rise. The Nobel Institute, obviously moved by a sufficient number of calls to comment on the status of the award for the 1991 recipient, deemed the decision immutable. As for the prize itself, it is long axiomatic that persons who tend to get it have blood on their hands. The terrorist, reborn, is feted by the Nobel Prize Committee. Before ploughshares came swords. Before peace, there was the shedding of blood. But, in some cases, it may well be the reverse: from the ploughshares come the swords, and the Rohingyas are tasting that awful fact.